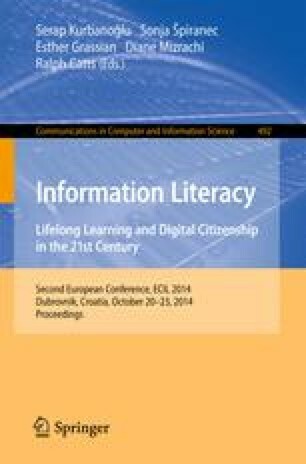 The paper discusses some current methodological issues related to the field of Information Literacy (IL). It aims firstly at discovering what qualitative procedures have actually been employed in the empirical investigations into various aspects of information literacy in years 2011-2014. Secondly, it seeks to categorize them into research methods, data collection techniques/data sources, analytical frameworks, etc. The paper is descriptive and exploratory in nature. A critical literature review has been the leading method. The EBSCO’s specialized database LISTA was searched to find articles reporting empirical research on different dimensions of information literacy. The main observation is that in years 2011-2014, as in the previous periods, the three methodologies (qualitative, quantitative and mixed methods) have been used in the IL research. The preferred qualitative data sources were the focus group and individual interviews. As for conceptual frameworks, the information practice or people-in-practice as well as socio-cultural perspectives seem to be growing in importance.